Fuchsias are one of the most popular plants grown with their striking and unmistakable nodding, and often bicoloured, flowers. There are approximately 100 species, mostly from temperate areas, and more than 15,000 hybrids and varieties. They vary from small trees to shrubs and cascading ground covering plants. Fuchsias are widely cultivated garden plants across much of the developed world. Their popularity seems to be cyclical, going through periods of greater and lesser popularity, as new generations of gardeners discover their attributes. Whilst they seemed to lose some popularity towards the end of the twentieth century, these 19th century favourites are once again charming gardeners with their elegant two-tone flowers that can brighten up any garden. 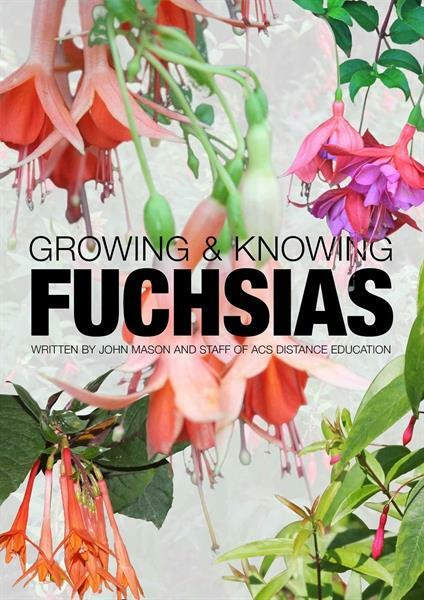 For the fuchsia enthusiast, this ebook may help to develop a better perspective and fill in some elusive gaps in their understanding of the genus. For the amateur or beginner, it will provide a foundation upon which to build knowledge and understanding as they explore the possibilities of growing fuchsias in their own gardens. The Growing and Knowing ebook has 124 pages and so many wonderful colour pictures of the many varieties of fuchsias. Love fuchsias? Why not study our fuchsias course. Click here for more information.